The most important step to reducing your risk for breast cancer is prevention/early screening. RAPID CITY, S.D. 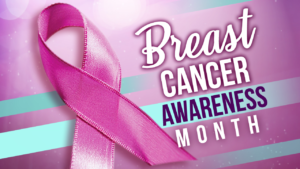 – October is the month known for Breast Cancer Awareness – to raise funds for research into its cause, prevention, diagnosis, treatment and a cure. It’s also used educate people about the importance of early screenings. Breast cancer is the second most common kind of cancer in women. Approximately two women are diagnosed with breast cancer every day in South Dakota. The good news is that patients can survive it if it is found and treated early. A mammogram is an X-ray of the breast and is the best tool for early detection. It can find cancer, like a lump, when it is very small, even too small to feel. The best way to determine if you are at average or high risk for breast cancer is to talk with your healthcare provider about your family history and your personal medical history. In general, women at high risk for breast cancer include women with a family history of breast cancer in a first-degree relative (mother, sister or daughter), women with an inherited gene mutation and women with a personal history of breast cancer. With that being said, many still get the disease with no family history. Lifestyle choices that can keep your risk of developing breast cancer as low as it can be are: maintaining a healthy weight, exercising regularly, limiting alcohol, eating nutritious food and not smoking. At the end of the day, you know your body better than anyone. And if something feels off, getting it checked out will give you a peace of mind. Regional Health Spearfish Hospital offers 3D mammography, which is the newest technology that improves early detection and treatment. After the first of the year, the Regional Health Medical Clinic Flormann Street will offer the 3D imagery. Click here for more information on 3D mammography.